Karen Burns-Booth offers the best of both worlds in this pasta and cauliflower cheese recipe. Using mezze penne tricolore adds vibrancy to this often beige dish, which is given a little crunch with some toasted hazelnuts. 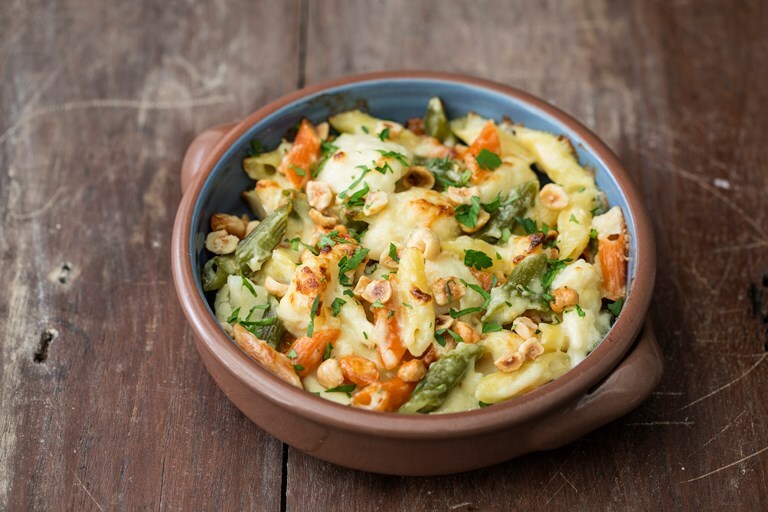 This wonderful family dish for cauliflower cheese with hazelnuts and penne pasta is a cross between the eternally popular cauliflower cheese and macaroni cheese, but with an elegant and sophisticated twist, that will still appeal the children and adults alike. Using mezze penne tricolore adds a bit of fun as well as colour to the recipe, and the quill-shaped pasta is the perfect shape and size for the unctuous coating of cheese sauce.